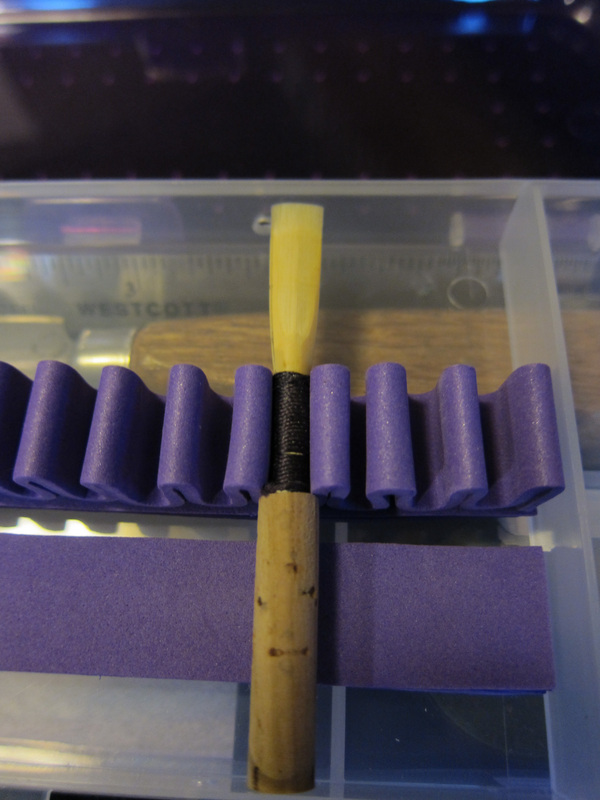 My friend — the fantastic oboist Mingjia Liu — has a company, MusEcho, that is making some wonderful reed making tools. He sent me some to try, and I’m mightily impressed! 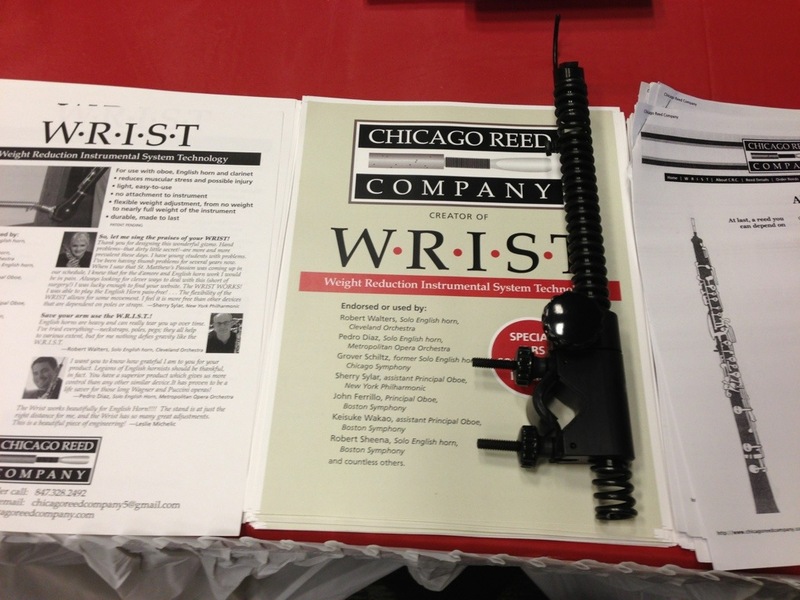 Below are images of these tools. Not only are they very high quality, but they are beautiful. Yes, I like things that look lovely! Here is an image of what I received. He does have one more tool there — a twin splitter — but I don’t split my own cane, so I had no need for that. The following links will take you to the page talking about the item. The “Bev-LLow” knife feels fantastic in my hand! 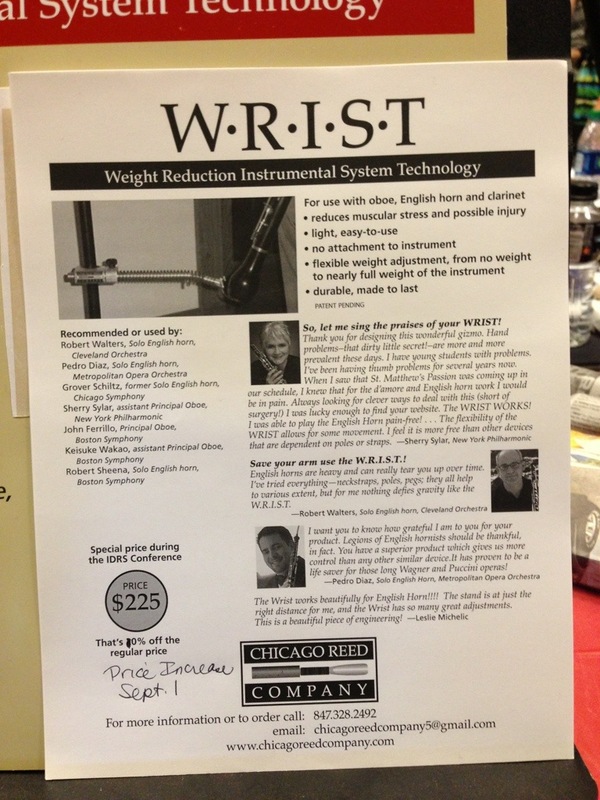 It is comfortable, a great weight, and works very well when carving. Look at that gorgeous wood and great sheath! Oh … and there’s a magnet in the sheath so you can attach your plaque. Handy! This is waxed thread. Yes. Waxed. How cool is that? Read more about these spools at his site. VERY clever! FINALLY! A gauge ruler for both left handed and right handed people! This is one brilliant ruler. Both sides are marked. I’ve been dreaming of something like this for a long time! And of course there’s the gauge to measure cane diameter. Handy! The burnishing rod is a handy tool too: the magnetic rod fits inside its handle. This is not a lightweight tool, but I love it. And of course it’s also a lovely tool to look at … plus I love that it comes with a holder. I like my tools to be neat and tidy. BRAVO, Minjia, and thank you so very, very much. These are fantastic! 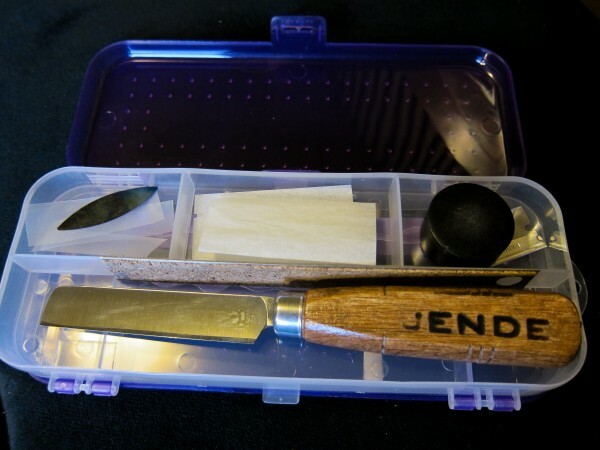 I received a lovely email from Ryan Walsh, the owner of the company ReedsInCase, and he sent me a sample reed and a Tool Kit Reed Case made by Jen Case. 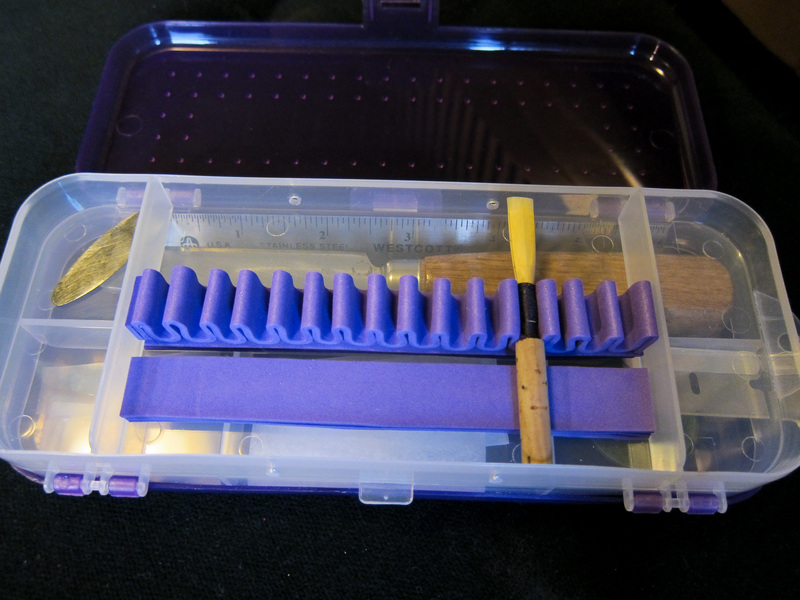 The latter is quite clever, and wonderful way to carry both reeds and tools in a lightweight case. My Landwell won’t fit because it’s handle is a bit too thick, but the Jende barely works, and my Vitry knives fit easily. The reed plays well. I really should purchase a few others from Ryan just to see about the consistency of them, but I was impressed. It’s a rather long reed (over 71mm), and I did a wee bit of carving. It’s not uncommon to need to fine tune a reed, especially when it was made in another part of the country, so I have no problem with that. I may end up clipping the tip a bit, but we’ll see. I’m going to take some time with it to allow it to adjust to California. After all, it’s had a long trip! There are other reed cases as well, so be sure and check out all their products! Thank you, Ryan and Jen, for your wonderful generosity! I think your products are great, and I hope your business is very successful! Ooh, A New Toy To Try! Okay, I confess I’m a gadget girl. I think I can blame Dan … don’t you agree that would be an okay thing to do? It’s wireless. How cool is that? When we tune an orchestra most of connect our tuner to a pick up and attach that to the bell of our oboe. Not having that wire seems so darn cool to me. Of course the best thing to discover would be the everlasting reed, but so far no one has bothered with that. I really don’t understand why it’s being ignored. Sooo … I hooked it up (it’s pretty easy to figure out!) and I’ll be taking it to Symphony Silicon Valley rehearsals next week to use and to show to my colleagues. I have a feeling I’m gonna really like the device! I’d put the video up here, but I can’t see the code for that. Oh well. You’ll just have to visit his site!